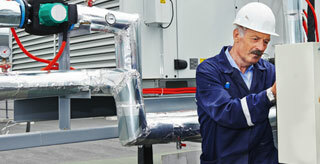 Do you suspect heating problems or ventilation problems in your building? Whether you are experiencing issues now or are working on HVAC emergency planning, learning to identify common problems in your HVAC system can help you be more proactive to your facility’s climate control needs. Air conditioners use refrigerant to absorb heat and provide your system with cooled air. The refrigerant lines run between the compressor in the outside unit and the evaporator coils in the indoor unit. A leak in this line would cause a loss of refrigerant which could have a negative impact on your system. It will start running more frequently because it isn’t reaching the cooled ambient temperature that would trigger it to stop. This could cause your compressor to overheat or even burn out. Ice buildup on your lines and coils could cause irreparable damage as well. Routine checks of your coils, refrigerant lines and compressor can help spot a leak before it causes damage to your system and in some cases prevent a leak before it starts. If you suspect a leak, you can use refrigerant leak detection to help identify the source before it worsens. Air conditioning units build drain lines into the system to drain off water from the evaporator coil. Water can accumulate from the condensation that occurs naturally by the air conditioning process. Sometimes these drain lines can become clogged or blocked, which can cause a water backup into or around your system. A backup could mean serious water damage, especially if the clog goes unchecked for a long time. This isn’t just water damage to your system, but water damage to your building as well. Inspect your drain pan and the area around your indoor unit on a monthly basis. Annual flushing of the drain may help prevent clogs before they begin and help keep your system running properly. Common ventilation problems are often found in the air ducts. Items creating blockages in your facility’s ductwork will prevent your heated or cooled air from distributing properly throughout the building. Causes of blockages in ducts include loose or fallen insulation and dirt. Ducts can also become damaged and leak. It is also possible for your vents to become blocked. Blockages are often caused by a piece of furniture or equipment being placed on or in front of the vent, though it is possible for debris to get stuck in the vents and cause an obstruction as well. Before turning on your system, check your vent locations to make sure they are clear of obstructions. You can also remove the vent covers and perform preventative sight checks of your duct system to ensure it is clear of debris. If your system is not running, it could be that there is an interruption in the electrical system somewhere. The first place to check is always your breaker; it’s very possible your unit has blown a fuse. Contactors are also a frequent culprit for electrical problems. Sometimes the contactor may stick, keeping the unit running. Contactors can also become worn, which can prevent electrical connections from being made and the current to from making its full circuit. Routine maintenance of your electrical components can help prevent electrical problems. It’s important to regularly maintain your system by changing out worn parts and wires. Of all heating problems, a gas leak can be the most dangerous. If your heating system runs on natural gas, you can be at risk for a gas leak. Leaks are usually caused by a crack or a disconnection in the gas line. These should always be taken seriously and fixed immediately; gas leaks can and do cause explosions. Professional HVAC contractors should offer inspections that include checking your gas lines for potential hazards. Heading off a leak before it starts is the best measure of safety and success. It is recommended to have your system inspected every year to make sure it is in its best running condition. These checks should be done off-season if possible. Fixing heating problems or ventilation problems when the system is not in use can enable you to make any necessary upgrades without causing an interruption in your facility’s climate-control needs.